People here need to realize this will not stop in Wisconsin. The Greedy capitalist like the Koch brothers and the Conservative movement will not stop until most American workers are reduced to serfdom living in cramped substandard housing working for a bowl of rice at the end of the day if they have a job. They will be no vacation time off, no pension, no worker rights no time and a half for overtime and most work weeks will be 60 hours or more. 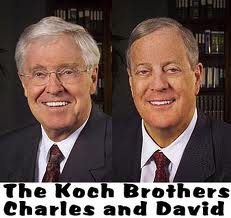 People like the Koch Brothers can never be rich enough and never share profits with workers. You don't have to have worked for a union to benefit from union strength. Koch brothers own the NC Legislature, too.